Hello, first time posting here, thanks for your time! I just recently built a new computer, core i5 3570 Ivy Bridge and 8gb memory. Graphics are Intel Graphics 4000 on the CPU chip. I also installed a LG blu-ray disc burner. Windows 7 Pro 64. I copied a bunch of documentaries that I had recorded from an old stand alone DVD recorder hooked to the TV to my hard drive. The files are about 44 minutes of mpeg-2 video each and were in the 750 MB size range. The frame size is 352x480 at 4 mbps. 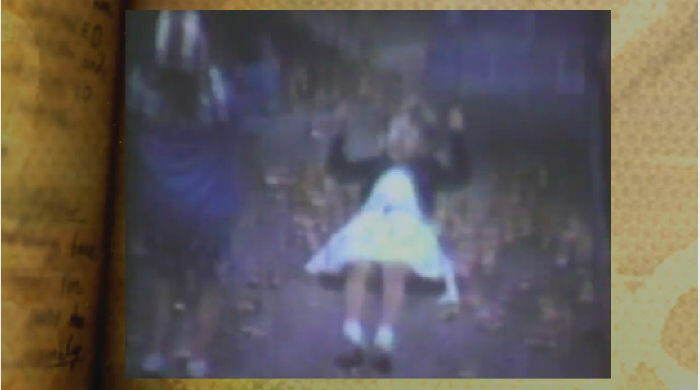 This is mainly VHS quality but good enough. I bought the blu-ray burner with the intention of putting these programs onto a blu-ray to play back in standard def only, no high definition video is intended. I assumed with the expanded space of blu-ray, I could put many more documentaries on one of these 25gb discs, reducing the number of discs in my collection. I already have a Philips blu-ray player hooked to the TV. I started up MY DVD and chose a 25gb disc. I put one file in the play list and it showed it taking 3.1 gb! 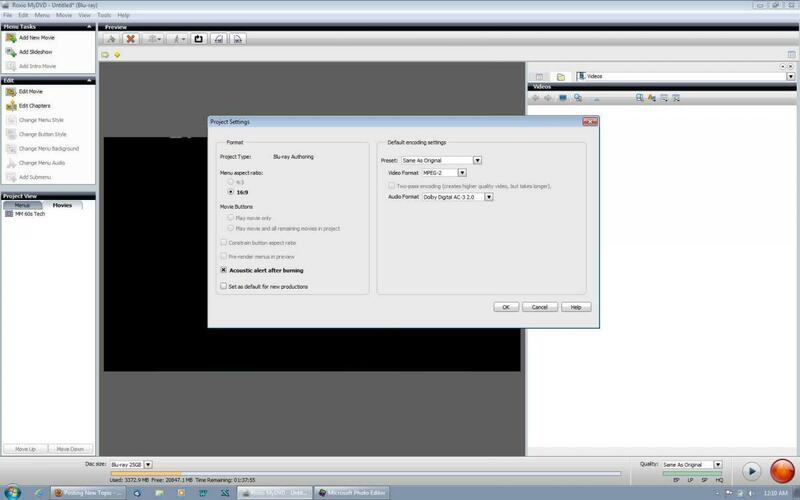 I went to project settings and there is very little to change, the video format was AVC. I assume it wants to convert the video to a large frame size. I changed it to mpeg-2 and the file size actually enlarged a little, I had also chose "same as original". Are 352x480 videos in mpeg-2 even valid for a blu-ray? Does the video have to be converted to a different file type? My stand alone blu-ray player cannot play AVCHD videos recorded on a blu-ray disc (it can play them if it's on an SD card). I also have Power Director 10 from Cyberlink. It also wants to turn these files into 3.3 gb sizes using 720x480/60i quality. I know it's probably trying to use a really high bit rate that's making it bigger. I suppose 4 mbps is invalid for a blu-ray? I read that you can put up to 23 hours of standard def on a blu-ray disc. At this rate, I can only put about 7 documentaries on one 25g blu-ray when I could get 5 on the original DVD! Attached is a screen shot, any help is greatly appreciated. Thank-you! But all Movies have to be Rendered into a very specific format and the disc Authored in a specific format in order for a Player to play them... They are not simply files slapped on a disc! But a 25 GB BD-R & EP will still yield 6:24 hours or about 8 3/4 of your shows... Is that enough? One thing you will probably want to test out is is use a Background and add the movie file as an Overlay at reduced size. I guess I should have clarified in my post. 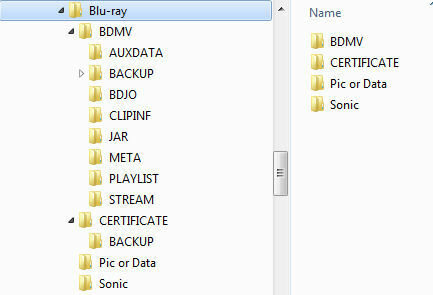 My Blu-ray player does play AVCHD files from a DVD disc, but not from a blu-ray disc. Anyway, you were reading my mind, I am going to get an RE disc to practice with. Maybe look into a couple Blu-ray double layer discs as well (pricey!). Your information makes sense to me and I understand the process. So I'm going to do some experimenting and see what I get. Thanks for the help! won't play AVCHD on BD... are you sure?